For any of you that have not settled on your design yet, don’t worry. I am just going to address this part of the preparation stage since I have the time. This whole collaboration is set up to be flexible around everyone’s schedule and timetable. The information will be here when you are ready for it. Most of the time, I just end up drawing a design directly onto the wood. I do this out of poor planning and being what some folks might call lazy. The better way is definitely to draw your design (to scale) on a piece of paper. You can refine your drawing this way and it takes much less time to change a design on paper than it does with wood. When you draw your design, draw it from at least two perspectives, the top view and the side view. This will allow two advantages. First, by having both a top and side view drawn, you can spot potential problems with the design. The top (bird’s eye) view might look really great but when you draw the side profile you might realize that the proportions don’t quite work so well. Maybe you see that the piece will look chunky, or maybe realize that the spoon will tend to roll to one side and a change of the pencil line steadies it up. The second advantage comes when you set about cutting your spoon design out of your wood blank. By transferring both views to the top and side of your wood blank, you can cut out the spoon shape from both angles and this alone will save you a couple of hours of carving. Some shapes that are more ‘blocky’ can be cut from one angle and be rounded off. On the other hand, a more slender and/or curved piece cut from both angles will pretty much leave a minimum of carving. I mentioned early on that once you get the blank cut out, you’re almost done! The real smart thing to do is to transfer your drawing to a piece of clear acetate or plastic film. You can simply lay it atop of your paper design and trace the lines. By doing this you get two more benefits. (yippee!) The first is that you will be able to see the wood grain through the plastic… and you can reposition the drawing over the wood and take advantage of any structural and aesthetic characters in the grain. You can make use of… (or avoid) knots, figure, color, etc. The second benefit in using plastic is now you have a reusable template in case you want to reproduce the spoon. Simply store the template until you get ready to carve the next spoon and you have avoided having to redraw the design. Now the truth of it is, I usually don’t remember to do this until after I am midway into carving the spoon. But it really IS a good practice to keep. After you have settled on the positioning of the design, simply tape one end of the plastic to the wood, slide in a piece of carbon paper and by retracing your lines you sketch in any details. If the design is simply an outline, use a pencil or scribe to draw the outline onto the wood. If you are set on just using the paper template, use glue to attach it to the wood instead of just taping the edges. Since you will be sawing both top and side, the glue will hold the paper much more securely than the tape. And if you are using a band saw or scroll saw to cut out the blank, the tape has a tendency to ‘drag’ on the saw table. So…. what tool are YOU going to use to cut out the spoon blank?? Depending on the size of the blank, the best tool is either a band saw or scroll saw. A scroll saw is great for the smaller pieces. It can also make internal cuts that can save a ton of time and effort. I want one! It is also more suited to making sharp curves and intricate shapes. But if the wood is more than a couple of inches thick…. Start up the band….saw. A band saw is a great all around tool, no doubt about that. For most spoon designs it does an adequate (and quick) job… depending on the blade installed. The finer the blade, the tighter the curves. A wider blade can be used to lesser effect, but by making relief cuts you can coax a curve out of even the wider blades. Up until this past January I used a pruning saw to ‘block out’ the wood and then I used a cheap fretsaw to rough out the shape. This process left a bit more carving to do, and at times felt a whole lot like work, but in the end it is a workable option if you don’t have access to the fancier equipment. That’s why I said earlier that once you get the blank cut out, you’re almost done. Me, I’d rather be carving than sawing. Regardless of which saw you use, use it with presence of mind and follow all of the safety ‘rules’ for your particular saw/equipment. You know, be familiar with the controls, capabilities, capacity and stay alert. I recommend cutting out the top view of your design first…. Keeping the saw blade just outside your pattern line. The more consistent you can be with following the line, the more true to your idea the finished spoon will be. If you are looking for symmetry (as a lot of spoons tend to be) , it will be much easier taking your time on the cut instead of ‘making up for it’ during the carving process. Hopefully, you have started with a wood ‘block’ that is fairly squared up. This will help both with keeping the symmetry and also it is much safer. You want the block to sit flat on the saw table. (Fret sawing is a bit different, the block needs to be securely anchored while sawing). Do NOT discard the off-cuts from the wood block as you cut out your spoon design. The reason for this is that when you flip your wood onto its side to cut out the side angle of your design, you will want to use these pieces to help give that ‘flat bottom’ back. It is basically a matter of reassembling the pieces (as if they were a puzzle) with masking tape. Here tape is better than the glue since you will be only wanting to hold those pieces in place while you make the second cut. But make sure the pieces are secured tightly together when you make the cut. What can happen if you do not use these off-cuts to stabilize the wood block is that, depending on the design, after the first cut the bottom of the ‘block’ may not be flat and stable enough to keep the piece from rolling or tilting. Two DISadvantages here… first, you can ruin your spoon blank. Second….. you can ruin your fingers! When you make a cut on one end and having cut through the tape, a ‘supporting’ piece might fall away. Stop the saw, re-tape the piece securely onto the block and continue with the sawing. You have to keep in mind that when one piece of the block is cut away the other end is supporting the block….. but if you continue on and cut the other end, you have lost your support. Keep it in your mind that the ‘block’ has to be stable in order to achieve accuracy in sawing, and more importantly, safety in sawing. This would be much easier to explain with photos, but I don’t have access to the ‘shop’ just now. (My buddy got himself hospitalized) If any part is unclear or you have specific questions I will be happy to respond. Carving tools are next on the agenda……..
Confucius say: Never sleep while sawing logs. huh?! Thanks, Spoontaneous, it was another good one. I’m really looking forward to the next one about carving tools. I like your comments. Very detailed and easy to follow. I do differ in cutting out the blank. I like to do the side profile first when starting with a squarish block, followed by the top profile. I find greater stability this way as the top view is wider and I don’t have to worry about the spoon curvature. Otherwise I would have you in my classroom teaching, anytime! Spoons, your a mine of information as we say in this neck of the woods. I have a design and cut it out… Jacaranda is the wood i think should work out well. although very hard. Murch ~ I used to fly into this little town in Indiana called French Lick. They had a bulletin board and one of the things posted was this cartoon that read…. “I taught him everything I know and he’s still stupid.” Anyways, I grew up in KY and the mines were ‘strip mines’.... can’t get much shallower than that. ha! I looked to see where your “neck of the woods” is and see you are in Ireland. A lady from Tipperary just bought the Zipper spoon last week. First sale in about 100 years. Jim ~ I had seen photos of Jacaranda wood but never the tree, so I looked it up on Google images and what a beauty. I can’t wait to see what you have come up with. My spoons are a little more ‘out there’ but there is no way I can match the detailing on those ‘scrolls’ that you master. (and I have tried) Remember, this is a collaboration and with your carving expertise I totally welcome any occasion where you can chime in. Folks will definitely gain from it (including me). that I might want to keep. Thank you for class. This spoon design is by far the most difficult I have tried. I am looking forward to learning your technics and views of how you create your very inspiring pieces. Okay, I’m officially in now. I’ve had your “Spunes” design tumbling around in my head since the first time I saw it. My idea is a spin-off from that inspiration. I’m calling it “Just Spooning”. 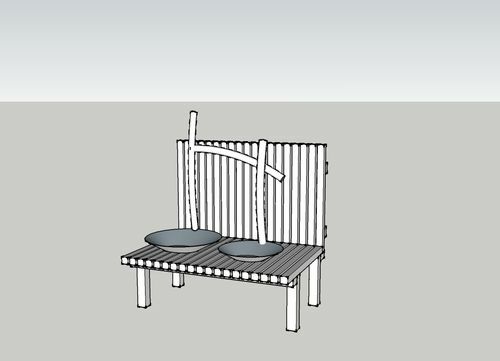 Here is a crude sketchup image of what I had in mind. I’ve never made a spoon before. Is this idea possible? Good morning folks ~ I apologize for ‘disappearing’ over the weekend. My buddy that lets me use his garage for my spoon carving was hospitalized and diagnosed with Alzheimer’s disease… at only 56 years of age. He is an ex-Navy Seal that has always been ‘full speed ahead’ but the last year or so he has been losing his balance and having difficulty with basic tasks. I had made him a cane a while back but he still falls now and again. Anyways, even with the Navy Seal background he has a very generous heart and has always offered assistance to anyone in need. I spent some time this weekend helping to get his property in order. I also created a poster of spoons that I am going to offer on my ETSY page and any dollars from that will go to his benefit. He is unable to work or drive himself. I don’t want to distract the spoon carving conversation, but I did want to explain my absence. Beth ~ Well… yeah. I think the idea is definitely possible. I have not experience with the sketch up software so that is throwing me off a little. Is the bench looking background going to be a stand for the spoon? And am I seeing it right as a ‘double bowl? If so, you might consider having the bowls attached at the lip just to add support since the handle(s) are relatively slim. As for the handle… I like that look…. a sort of Asian effect. I can’t believe you haven’t made a spoon yet… considering your other projects. I’d say it is high time. Jim ~ If this is going to be the most difficult design you have tried… then I am wondering what to call those other ones you have done. For me, they look plenty difficult. I’m looking forward to seeing it come about… and I already love the title. Alright… I’ll get to work here and finish up the post on TOOLS. I was thiinking of two spoons with the bench as a countertop stand, but it could work as a double ladle with the “arm” as a handle. What are your thoughts? I can see it both ways! I really like the idea of a stand. Somehow that adds a certain ‘quality’ to the idea… sort of like putting something on a pedestal…. it lends something extra. I say go with your initial impulse and if that impulse changes mid-stream….. so be it. I can see that you have put some thought into it. Spoontaneous, I’m really sorry about the diagnosis of your friend. I know a little bit about the disease since my father had it for about 15 years before he died and my mother in law also has it now. It can be a very trying ordeal and you are to be admired for looking after your friend. BTW, I want you to know that you have inspired me to do my first spoon finally. I did it this weekend and even though it is a simple rustic spoon I am quite happy with it and enjoyed doing it very much. I’ve been putting off carving a spoon for 3 or 4 months. So thanks. I hope there will be many more.